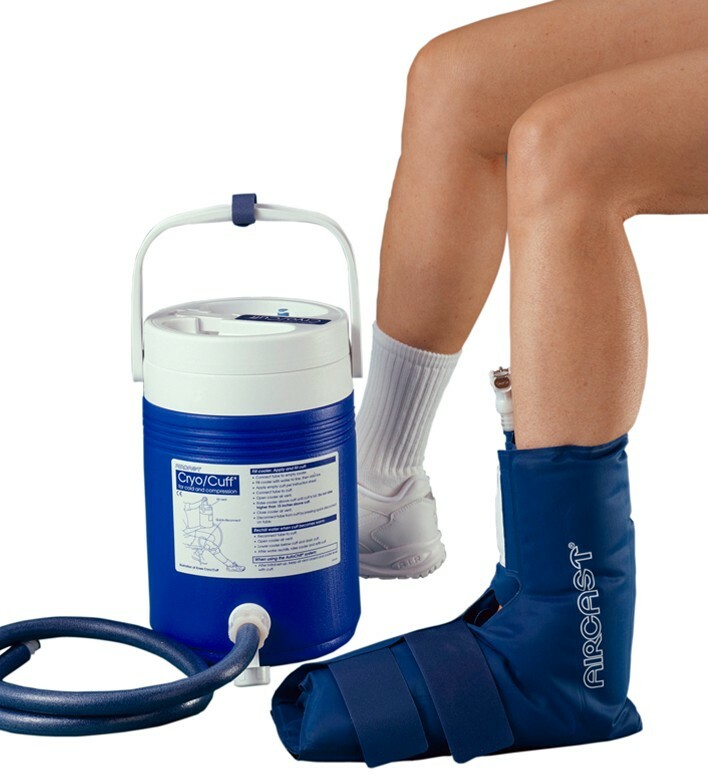 The Ankle Cryo/Cuff combines the therapeutic benefits of controlled compression to minimize hemarthrosis and swelling, and cold to minimize pain. The cuff is anatomically designed to completely fit the ankle providing maximum cryotherapy. The Ankle Cryo/Cuff is one-size for adults and is also available in a pediatric size. Includes ankle cryo/cuff and cooler. Thank you for your question. To reduce the pressure in the cuff, make sure the cooler is level with the cuff prior to plugging in the unit. You must also make sure to always apply the cuff empty. Also when filling the cuff, the height in which you hold the cooler will have an effect on the pressure applied during the treatment. To lessen the amount of pressure during treatment old the cooler at a lower height above the cuff (suggested height is 12"-15"). If you have any further question, you can call the product support lilne at 888.504.3251. The coolers that require a prescription, are the covered by medicare, United Health Care, or Tricare. Can the cuff be used over a splint or cast? I don't believe you will feel all cold through a Cast or Splint. The Cuff should be applied to the injured body part with a thin layer of clothing between the cuff and the skin. Yes, you can take your boot off, and use the cryo-cuff. How to I empty water from the cuff? Keep the blue hose connected, and lower the cooler below the level of the cuff. Gravity will drain it back into the cooler. Does this cuff provide cold therapy to the entire foot area? I am recovering from a 5th metatarsal injury and want to make sure it provides cold therapy to this area. Thanks. Yes this cuff will provide cold therapy to the foot and ankle. Can I purchase just the boot? I already have your product when I had back surgery. I have been using the ankle cryo cuff w/cooler for over 13 years and it is still in great shape. It cut my rehab time by at least 1/4 and keeps me walking. I had a pylon fracture of both leg bones at the ankle and use it after follow on surgery or whenever the ankle gets sore and swollen. I heighly recommend purchasing this product.